The Rotary club of Stourbridge is helping to improve reading abilities for children in Wollescote Primary school by the provision of reading books in a ‘corner’ library in classrooms. Wollescote school has a high proportion of children with English as a second language. 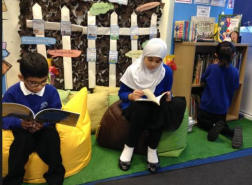 By encouraging reading in English for pupils this will not only improve their communication, enhance their learning, and through access to modern books develop future life skills.